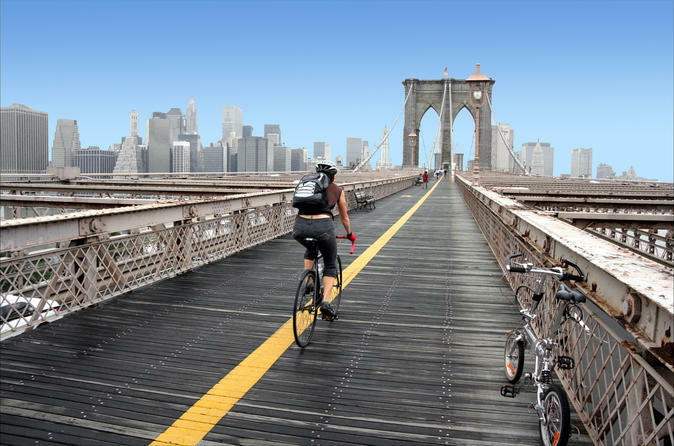 Fall in love with New York City as you explore by bike at your own pace. Discover Lower Manhattan's famous sights including Little Italy, Chinatown, Battery Park and Wall Street, and coast across the Brooklyn Bridge for incredible views of the New York skyline. A map and bike lock are included, so you can easily navigate the city and stop anywhere you like to shop, eat and sightsee by foot. Biking is one of the best ways to experience the Big Apple, and with several rental options, you have the flexibility to create your own sightseeing itinerary. With the full-day option, you can cruise farther north through Manhattan to visit must-see sights such as Central Park! Bike rentals regularly sell out weeks in advance during the peak season, so book ahead of time to avoid disappointment! Pick up your bike near Manhattan's South Street Seaport, a historic area located where Fulton Street meets the East River, adjacent to the Financial District. You'll be provided with a bike, map, bike lock, helmet and bike basket to carry your belongings. When you're ready, hop on your bike and hit the town! With your choice of several rental durations -- from 1 to 4 hours to a full day -- you can create your own sightseeing itinerary and explore Manhattan at your own pace. Your map lets you easily see which attractions and areas you want to visit, such as Little Italy, Chinatown, Wall Street, Battery Park and One World Trade Center (Freedom Tower), all within about 1 mile (1.6 km) of each other. Coasting along the East River or the Hudson River, enjoy an easy ride with the fresh breeze in your hair, whizzing past the heavy traffic and slow walkers. Think of what else you could see! The pedals are the limit. Cruising over the Brooklyn Bridge is a must -- you'll be treated to amazing panoramas of the New York City skyline, plus Brooklyn offers great sights such as DUMBO, Brooklyn Heights and Brooklyn Bridge Park. If you rent for a full day, you have more time to bike to other must-see Manhattan attractions such as Central Park! Lock up your bike and stop wherever you please to shop, grab a bite to eat, or walk around. After your independent bike tour, drop your bike off at the rental shop before 7pm. Bike rentals regularly sell out during peak season; with this Manhattan and Brooklyn bike rental, rest assured knowing you’ve pre-booked and pre-paid, guaranteeing fast, hassle-free bike pickup and drop-off. Special Offer - Book and saveÂ 45% compared to the local supplier's pricesÂ on 1-hour bike rentals! - Book Now!